When it comes to weddings, they are all special and we get to know the couple and share in their lifetime memories. We get to witness two people in love and be a part of their cake ceremony and their day. It is a blessing to be a part of each of our couples special days, but this one was a little closer to my heart. Let’s take it back, to when I was 18 year old, working at VANS, and met Amanda. Shortly after working with the company, Amanda was hired. We were 2 of 3 girls at that location, all 3 of us becoming close friends-company events, concerts, and bowling. I left the company a year or so later, yet remained friends with Amanda over the years. We went to the same college for a while-Amanda meeting me in the parking lot of the local McDonald’s for fun photo shoots and silly memories. We just enjoyed catching up, checking in to see what the other was doing, just enjoyed our friendship. Over the years we have gone on our own paths, but have kept in contact and when we got together or chatted, it was like we never skipped a beat of our free spirited friendship. Amanda met Jimmy. It was Love. Jimmy proposed. I was called for a cake tasting. Jimmy and Amanda met me at a local coffee shop to do their cake tasting. That was the first time I met the man I have heard so much about. I now know why Jimmy was brought into Amanda’s life. He was her other half. The way the glowed when they looked at each other, the way they shared in their laughter, the way they loved one another-there was no way that these two weren’t meant to be. Amanda and Jimmy decided on two flavors from their wedding day, Lemon Buttermilk and ShamROCK & Roll. Their wedding took place at Highland Springs Resort in Cherry Valley. The days leading up to their wedding were gorgeous. Their wedding day was chilly and a bit rainy, but rain on your wedding day is good luck. They were married under a large historic Olive Tree, outdoors. Their reception (due to rain) was under tents, and was elegant . Their centerpieces were filled with fresh Sunflowers, their favors were seeds in burlap bags, plant them to watch their love grow. It was sweet and represented the couple and their style. The cake table featured cupcakes and their cake. It was placed on top of wood stands lined with navy satin ribbon. 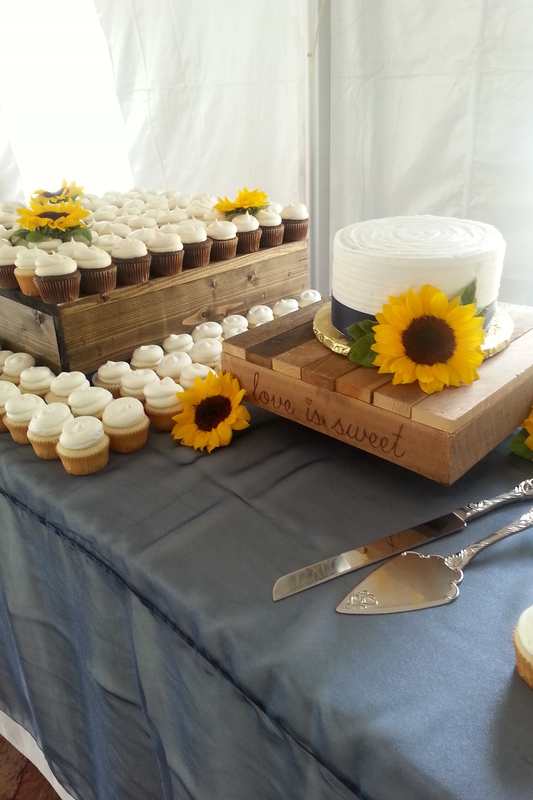 Their cupcakes were mixed with fresh Sunflowers, and their cake was a textured lemon buttercream, one sunflower adorned it perfectly. the Sunflower and Navy colors were classic and timeless for their outdoor wedding. I saw a sneak peek of their “first look” and it brought me to tears. As we left, their guests arrived and their joyous life together as Husband & Wife begun. Congrats to Mr. & Mrs. Sanders—you complete one another in the most remarkable way. love you both, cheers to a lifetime!!! Pasta Party // Happy 80th Birthday Grandpa!